1989 Major League Movie cards - NOW IN MY PC!! Nearly every collector has certain cards and/or sets that elude them for one reason or another. For some, it is a certain T206. For others, it may be that impossible 1/1 auto jersey card that someone else already has. For me, it has been the 1989 Major League movie card set. No, not the recent 5x7 version that Topps did in celebration of the 25th anniversary. I am talking about the ORIGINAL set, given out on ONE day of filming in Milwaukee. You see, the games shown in Major League was filmed, not in Cleveland, but in Milwaukee. Well, during one day's filming, the audience got packs of cards made by Double Bubble (which I believe is the original Leaf company, though feel free to correct me on that if need be). There were about 1000 packs total given out, according to legend/myth/estimates. While I did *NOT* pay $320 for the set, I did shell out a pretty penny. 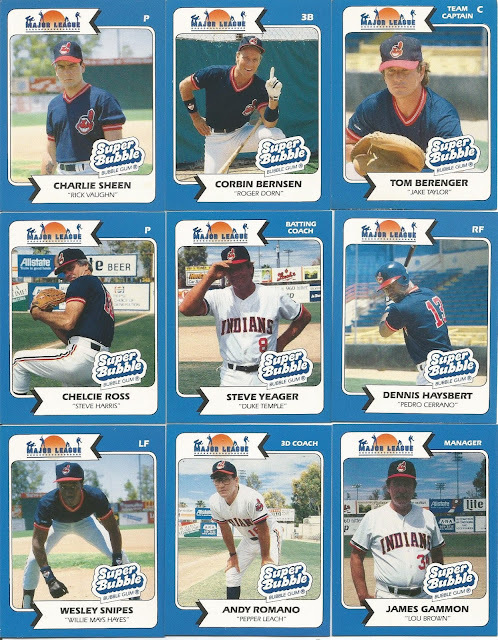 In terms of complete sets, it is the most I have paid for a single set of Indians cards ever. And, I couldn't be happier! 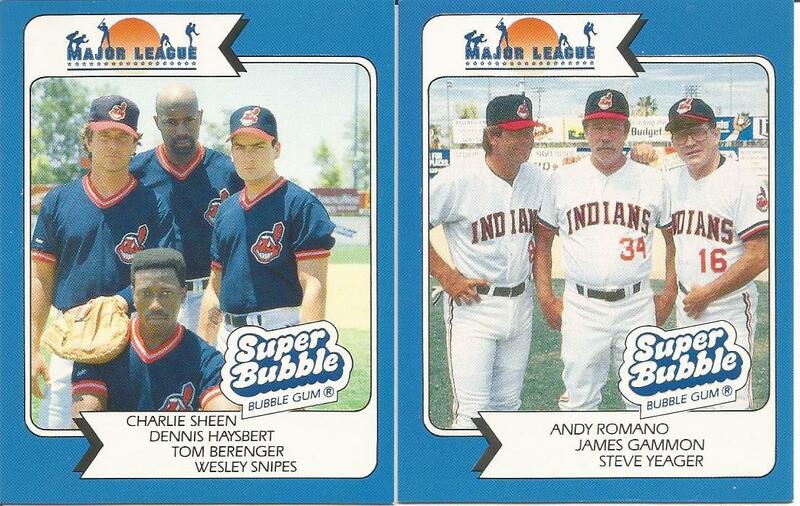 That's right, the ever-elusive 1989 Double Bubble Major League movie cards have arrived! Holy smokes! The cards are a hair wider than traditional baseball cards, meaning they won't fit in normal 9-pocket pages. The backs are blank. The images on the front are wonderful! The design itself looks like something a kid in his first Photoshop class might come up with: Steal the design from 1974 Topps, make the borders a mid-range blue, create a funky movie logo for the top and add the Double Bubble corporate logo. Oh yeah, remember to add info about the actor and role. I don't care. This is truly one of the most elusive baseball card oddball sets I have heard of, and now I am the VERY proud owner of a set!! WAHOO!! My heart is still racing. 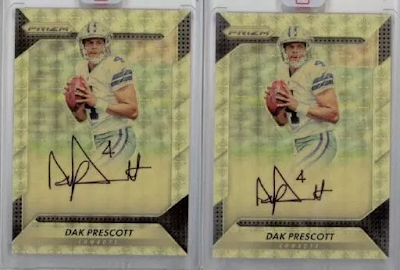 Panini Prescott Recall "Missing" Cards... DUH! 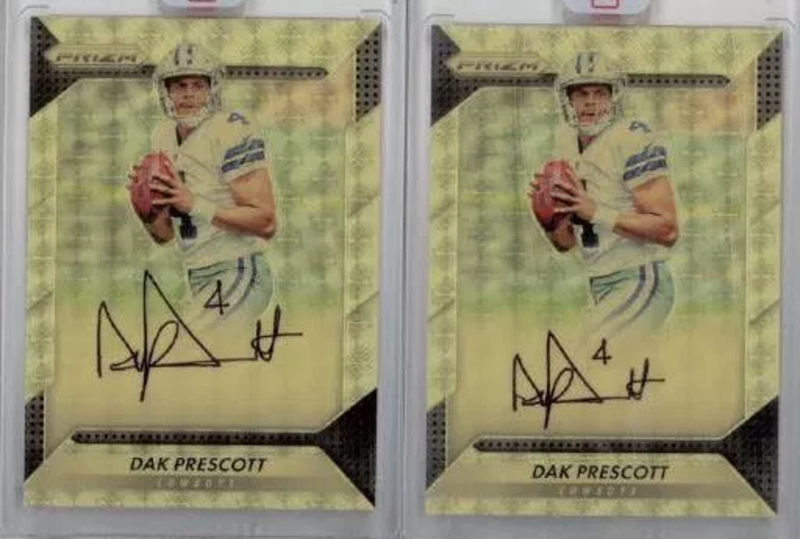 So, Panini issues a statement about the fake/autopenned Dak Prescott autographs. But, the statement simply talks about the recalls and that they will continue the contract with Prescott. Wow, how nice it is to have a monopoly on a franchise such that you can take part in fraud and simply brush it away as if it were nothing. Kudos, Panini. In the meantime, the statement also says that Panini is having trouble locating some of the recalled cards. Of course they are. Twitter is abuzz with talk of people keeping the autopenned versions because they will sell them off later for huge profit. Yeah, I called that one back when this whole thing started. In case you've missed it, there is a huge controversy regarding the alleged use of autopens on Panini's Dak Prescott cards. Autopenning is the use of machines to reproduce a signature. Sometimes, the signer holds one pen while a slew of machines hold additional pens, such that the autograph is instantly replicated as the original is being signed. Other times, a pen follows an existing signature while replicating the signature onto a slew of other cards. Either way, the player does not actually "sign" the additional cards. It's a practice seen off and on in the cardboard world over the decades. Why it won't matter: We, the hobby collective, don't really care. Oh, we care. At first. Right now, it's a hot topic and many folks in the hobby are steaming mad about it. Panini has even issued recalls on the cards so as to try and get the back, presumably to be destroyed. But, really, when all the dust settles, it means those autopenned cards that collectors held on to will be worth even more now. Why? Because there will be fewer available. And, we, the hobby collective, don't really care. Why it won't matter: We, the hobby collective, want autographs (not me, frankly. I mean, autos are cool, I guess, but I've never been goo-goo gah-gah over them). We want autos and we will continue to collect autos, regardless of how those were produced, obtained, and/or distributed. Ever since the beginning of collecting, autographs of the players and people we cheer have been highly sought. In the old days, it was more difficult to get autos of your favorites because you either had to get to the game itself or know someone that knew someone who knew someone that was going and would not only try to get the auto for you but then actually give it to you once they got it. Or, you had to hope a card show was coming close to your town and that your faves would be there. Autos by mail took off in the 70's and 80's. In the 90's, card companies started having players sign stuff you could actually get in packs. And we, the hobby collective, loved them for it. Allegations of autopens, having others sign the cards (*cough* Shaq *cough*) instead of the actual players, and other controversies flared up. But, in the end, it didn't matter. Why? We, the hobby collective, don't really care. Point all the fingers you want - at Prescott, at Panini, at MLBPA, at whomever - but, in the end, the real blame lies on us, the hobby collective. We will still seek autos. We will pay premiums for faked autos BECAUSE they are fakes. We will pay premiums because in the end, we don't really care. This week, I busted open a blaster box of 2017 Bowman. We pulled some cool cards in here!